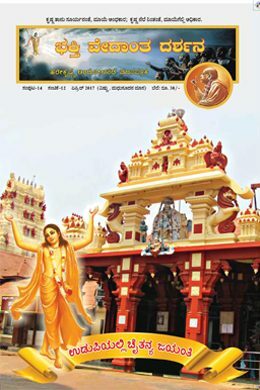 Bhaktivedanta Darshana is a Kannada monthly magazine. Every issue is rich in content aimed at bringing a gradual change in the lives of the readers by making them God conscious. It carries articles on spiritual subjects based on the teachings of Srila Prabhupada. We cover news and events about the temple. In addition to this, we feature articles about places of pilgrimage, biographies of great devotees, sattvic recipes, and interesting activities for children. Our purpose is to diffuse the wisdom of Krishna Consciousness through this magazine as said in the Vedic texts.